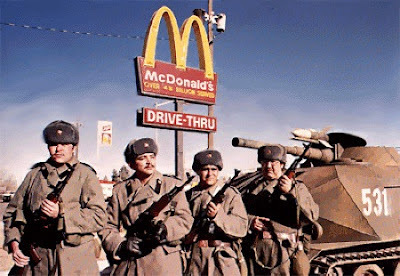 I've already written about Red Dawn before, so I don't want to repeat the stuff I said then by saying it again here. It's a crazy movie that I'm probably never going to really love, but I get it if anyone does. It's a well-made action movie and it is extremely passionate about its paranoid worldview. Milius' philosophy is maybe better represented here than in any of this other works (though a case could be made for Conan the Barbarian), which counts for a great deal. It's fun to see the cast of young stars before most of them got really huge. But there will always be a streak of nonsense that runs through the movie for me that keeps me from ever truly embracing it. I would never blame anyone for loving it, but it's never going to be a movie that's really for me. Previously available on Blu-ray from MGM, Red Dawn gets an upgrade courtesy of Shout! Factory's Shout Select line. I don't have the original HD version so I can't do a side by side comparison, but nowhere on the disc jacket is there a mention of any new 2K or 4K scan (which has become regular practice on these Shout! Factory upgrades), which leads me to believe this is the same HD master that was previously released. The movie looks very good, though, so I'm not complaining. The comparisons to the original MGM release don't end there; a handful of archival featurettes have been ported over to this new Shout Select version and make up the majority of the supplements. 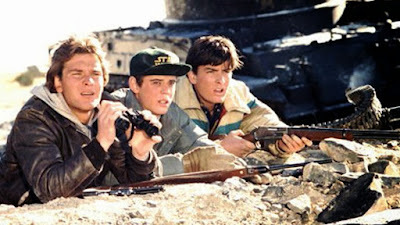 The only new bonus feature is a 70-minute retrospective documentary called "A Look Back at Red Dawn," featuring new interviews with Doug Toby (who plays Aardvark), casting director Jane Jenkins, production designer Jackson DeGovia and editor Thom Noble. It's an interesting piece, but I do wish that a few other cast and crew had been interviewed to paint a broader picture of the movie's production and its place in film history. I recognize that would have difficult, however, with the passing of star Patrick Swayze, the declining health of director John Milius and the declining sanity of Charlie Sheen. If you already own the original MGM Blu-ray of Red Dawn, I'm not sure there's a huge impetus for upgrading even though I'd rather Shout! Factory get your business. The transfer, I'm pretty sure, is similar if not identical and only one new -- albeit extensive -- bonus feature has been included. 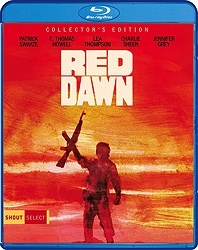 If you like Red Dawn but have never bought it, this is the one to own. Smear yourself with some deer blood (the leftover blood you didn't already drink), avenge Harry Dean Stanton and have yourself a swell night. Archival Featurettes: "Red Dawn Rising," "Training for WWIII," "Building the Red Menace," "WWIII Comes to Town"